In May 2007 Briskair released the ultimate Diesel powered, full 134a refrigerant Cooling system. Introducing the ECOWIND. Our Clients wanted a Diesel powered system that was quiet & compact, that adapted to an easy, efficient installation. We sourced the world for a product to suit most installation applications and Italy is where we found it. Lombardini factory, fully designed & manufactured with a single cylinder air cooled 9 horsepower engine, governed to 5.5hp running a Bosch alternator & starter motor. Our Ecowind system is designed for most sleeper cab environments. The system has an impressive output in excess of 15000 BTU, this unit is sure to impress the client wanting to also up-grade in Performance & Budget, from the KoolKat Refrigerated Electric cooling system. Our Ecowind comes standard as a split system installation, with the Condenser assembly mounted to the External rear wall, Evaporator mounted to the Internal rear wall & the Engine mounted either on the side chassis, above the fuel tanks or rear mounted behind the diff assembly. Custom installations are available on request, contact our sales team. With full remote control function, climate control, on board LCD screen with self displayed fault diagnosis & alarm, Auto start / record battery self start function, service history on screen display and acknowledgement, Generator mode, Timer start / stop mode, and the quietest system available in the Australian Market at less than 60 decibels. The operator is in full control or its fully automatic. Ecowind is 12 or 24v & designed to power from the vehicles batteries and draw diesel from the vehicles fuel tanks. Run time is endless, subject to Diesel supply and Maintenance history. 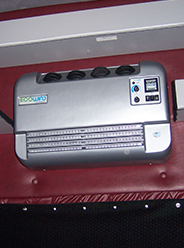 Choose our Ecowind System, if you sleep in your truck most nights of the week, you have a large area to cool, you want an on-board alternator, powerful cooling output, a diesel system that is considered the quietest around or just want the best system available on the Market. Although only introduced to the Market in 2007, Our Ecowind product has endured a lot of research & development over the years, with the release in 2012 of the Generation 3 Ecowind, we have listened to our clients and improved the system design to suit our harsh & at times un-forgiving Australian Roads & weather extremes. This system easily command’s industry respect with awareness & acceptance around Australia, we consider this system the best & quietest Diesel Powered cooling system available “The Ecowind”.